EVERY triathlon race is a father-daughter bonding time for Rochelle and Tyrone Tan and serves as her motivation to top every triathlon race she joins, just like in the First Triathlon Race yesterday at the Talisay City New Fish Port. Rochelle crossed the finish with her father Tyrone at her side in 2:11:29 and clinch the top spot in the women’s open. Hannah Lou N. Galo got second in 2:12:49, while Loveleinell F. Casidsid settled for third in 2:19:18. Though Tyrone crossed the finish line with his daughter, it was his second time to do so as he finished the race in 1:53:10 to top the 40-49 men’s division over Gandhi Truya (1:59:56) and Jay M. Pizarras (2:10:13). “Usually my father is the one who finishes first in his age group division and then he always comes back for me and it really helps especially if I am wearing out. Then when I see my dad, I feel like getting a boost because it means that I am already close to the finish line,” said the 19-year-old Rochelle, who admitted it was her father who motivated her to get into sports. The men’s open division was won by Kristiane S. Lim in 1:39:57, while Gerrie Calinawan got second place in 1:40:59. Franz Baguio got third place in 1:42:53. In the relay division, Victor Monsanto, Rainier Tan and Jessie Arriola topped the category with a time of 1:55:21, almost six minutes ahead of Jebb Lynus and Jorgina Cane, who finished in 2:01.06. Rhea Papas, Andre Pacheco and Eric C. Malimba got third place in 2:02.21.56. In the 30-39 age group, Eugene Sanchez (1:50:24) got first over Vellum’s CEO and comebacking triathlete Chris Aldeguer (1:53:25) and Ritchie Mataragnon (1:55:43). One of Cebu’s top runners, Moh Sherwin Managil, won his first triathlon race and topped the 20-29 age group in (1:46:16). He beat Frederick Pahanonot (1:51:15) and and Jarvis Nike B. Jaranilla (1:57:30). Douglas Sharpe won took the 50 and above title in 2:26.08 over Benhur Caderao (2:36:15) and Enrique C. Tenaza (2:56:48). In the kids division, it was an all-family affair with Yuan and Justin Liam Chiongbian and Ana Patricia and Luis Miguel Maximo topping their divisions. Yuan won the 11-12 in 42:32, while Justin Liam won the 13-14 in 40:13. Ana Patricia won her first race in the 13-14 in 51:04, while footballer-turned cyclist Luis Miguel topped the 19-below in 2:01:08. Niña Francesca Villaba got the 10-Under girls title in 55:08, while Aaliyah Ricci V. Mataragnon won the 11-12 division in 51:57.26. 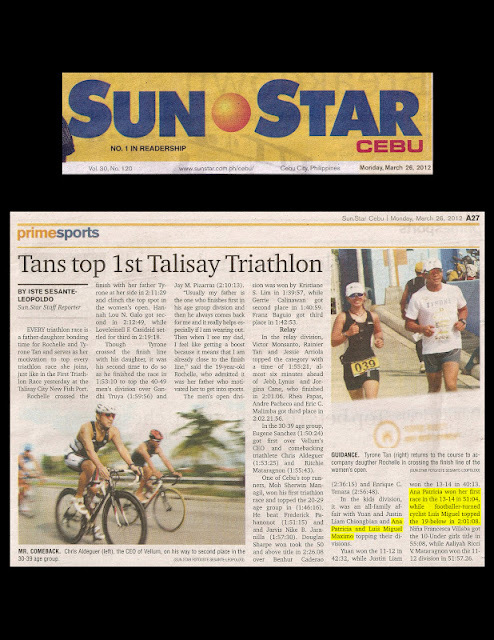 Published in the Sun.Star Cebu newspaper on March 26, 2012.